\ obtained at the Jewish Community Center and in the synagogues. \Or8on Skorr Orchestra and Hors D'oeuvre. srd Mahr and Nelson F.
and solidarity for the future." Of Nazi Criminal Entry in U.S. The bill, sponsored by Rep.
where it has been presented. tion has been donated by Advanced Visual Communications, Inc.
the Anti-Defamation League at 875-0750.
results, but we know he did us all proud! in academics, leadership and community service. daughter of Dr. Peter and Judy Levin. to Dr. Bruce and Claudia Kahan weighing 6 lbs. 13 ozs. Gabriel Alexander, born March 8 weighing 7 lbs., 4 ozs. Jonathon. Her grandparents are all in Tampa: Henry F.
and Mary Roder and Sol Kushner. tfried Florence and Al Mandelbaum, all of Tampa. South Florida College of Education on April 3. - daughter in New York are the reasons they go "home"
to the agency with a need. surprised to see only Mrs. T.
assistance is of major concern. children were asleep, and Mrs.
T. was too exhausted to talk. By the third session, Mr. T.
lush landscaping. REDUCED TO $259,900. during the years 1981 to 1983.
to Tampa from Toledo, Ohio. of the total camping picture. Mah Tov, a Shabbat program. most of her years in school. laws, just like her parents. timate friend of Indira Gandhi. His name is Miguel Serrano. with the words "Heil Hitler! year of the Hitler Era." active in Chile and Argentina. flour, and wine for the holiday. needy Jews in Algeria as well. felt at the Seder table. ween the two countries. Mr.
Institute, holds the Marc R.
sumptuous beyond your wildest dreams. parties of 8 or more. is THE COURAGE TO CARE. over four evenings: April 27, 28, 29 and SO (check local listings). Polish village UO years later. The wine people be lev* w\. COME TO ISRAEL COME STAY WTTH FRIENDS. husband will not be joining her this summer. swimming, folk dancing, movies and handcrafts. Book Review Gab 10 a.m.
Tuesday, April 28 at 7:30 p.m.
All preschoolers must be four years old by September I, 1987.
experience to prepare our oldest preschoolers for Kindergarten. I. Time: 9:00 a.m. 12:00 p.m.
II. Time: 9*)0 a.m. 2:00 p.m.
more time for extra enrichment and curriculum activities. .
Two Preschool Enrichment classes arc included in Extended Care monthly fees. "All preschool classes must have a minimum enrollment of ten students. A parent-child class designed for our youngest preschool children. All Playtot classes meet twice a week, Tuesday and Thursday. 9:00-10:30 a.m., 12-18 months. 'Must be 12 months by September 1, 1987. 10:30-12:00 p.m., 18-24 months. 'Must be 18 months by September 1, 1987. All preschoolers must be two years old by September I, 1987.
volunteer in their classroom throughout the school year on a rotating basis. This class is designed for our 2 year-old preschooler to solo with his/her classmates. This class will provide a wide variety of age-appropriate activities for our 2 year-olds. This class will facilitate our 3 year-old preschooler to participate in a total 5-day developmental program. Time: 9:00 a.m. 12.-00 p.m.
' '* f T -1 .......... "" *.....f I ... a.
M.IUK.X DAVID AIIOM .. ISISAlii. reside in the Southeast region. Magen David Adorn in Israel, Blood Services Center. Red Magen David for Israel. have indicated a desire for it. because the fuse fizzles out! round of inflation to boot! turn out to be non-events. All mIm include our exclusive on-site warranty. fresh air of fresh information. economy in the next decade. pass the virus to others. and bounds since its inception. assets valued at $7.5 million. Mr. and Mrs. James H.
iyan Stark and Lee Gerber, fourth graders at Schaarai Zedek periodontist. David Vermess, Matthew Friedman, and Daniel Jenkins. Does he cook with garlic? a cocktail party hosted by Mr.
brunch hosted by Dr. and Mrs.
Jack Mezrah, Mr. and Mrs.
rehearsal dinner hosted by Mr.
Lincoln Hotel hosted by Mr.
.....^ $? >.....* mw %,*&' "
Dietician in the James A.
dent of the student council. tory, 804 So. Dale Mabry. rights of our senior citizens." Sunday evenings, 7 to 9 p.m.
on WPLP Radio, AM 57.
growth in an open atmosphere. pioneer residents coming to Miami in 1926. Her aunts and uncle* came here in 1910.
tation, Robert (Carole) Levine of Miami, Dr.
with interment at Mt. Nebo Cemetery. AZA for its fraternal order. Ruth Eckerd Hall. Dietary Laws Observed. Dr. and Mrs. E.
sities in the world to establish a medical school. In photo: Dr.
Heller, Mrs. Heller, Mrs. Babat, Dr. LeVine, Mrs. LeVine. Saturday, 9 a.m. Daily morning and evening minyan, 7:30 a.m., 6:45 p.m.
day of each month, Masonic Community Lodge, 402 W. Waters At*, (at Ola). study dneuMon eeaona. '-Shabbat Exp*ri*nc*," monthly swvie. * anddW. Saturday, April 25 at 9:30 a.m.
and Sally Goldberg of St.
and friends from out of town. Saturday, April 25 at 11 a.m.
tivities are tennis and dance. will be hosted by Mr. and Mrs.
Mrs. Ronald Stewart and Dr.
and eggs, is a separate entity. routine, it is very simple." the same for meat," she said. home is given a good scrub. 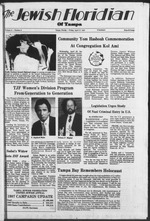 8 p.m. Tampa Jewish Family Services Shabbat at Rodeph . which is the most kosher state. they are taken care of." ing, draw men after him. child to make him/her unique. to succeed in their careers. part of the Hebrew program. employ a full time receptionist-secretary. Please call 875-1618 to schedule interview.